Coming from Bruxelles, on the E411 highway. 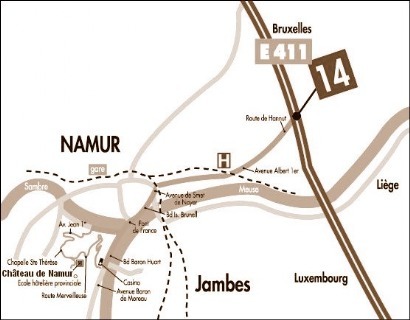 Take the exit n°14 Namur-Bouge in direction of Namur/Dinant. Drive along the Meuse river in direction of Dinant. At the trafic light (under the railway bridge), turn left. cross the 2 roundabouts and follow the road till the 2nd road on your left. When arrived at the top ("Reine Fabiola" Park) cross the roundabout and then the first street on your left. The Castle is located on your left.